Ralph Laurem RLX Button Sweater. Zip pocket on sleeve. Excellent Condition. Ralph Lauren Polo Golf Sweater. This sweater is in beautiful condition! Gold zipper with leather pull. 1/4 Zip Front. Shoulders 18". E xcellent shape. P it to pit22”. Ralph lauren Polo Hi Tech Crewneck. Size L. Only worn a few times. Excellent condition. From non-smoking, pet free home. Green, orange. From the recent reissue of the HI Tech range. This colorway is fairly rare from what I can tell. See pics, ask questions. Condition: 8/10 (small hole on back as pictured). The Size is 3XLT (3 XL Tall). Selling a denim and supply crewneck Aztec sweater. Sweater has some small white spotting but otherwise good condition. Check pics! Size is xl. Measures 24” from pit to pit. Measures 28” from top of shoulder to bottom of sweater. Measures 20 1/2” from pit to end of sleeve. Priced according to condition with free shipping! 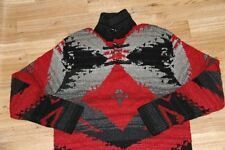 Very nice LAUREN RALPH LAUREN 1/4 Zip, black sweater with beige and red gridlines and in very good condition! Size - 3XL. Length - 31". Shoulder to shoulder - 21". Gently worn Ralph Lauren olive green merino wool button up cardigan with calf leather patch. Size large. In great shape but does have two small holes on cuff sleeve, shown in photos. Approximately: bust is 18 inches and length is 28 inches. Measurements shown in photos. Condition is Pre-owned. Shipped with USPS Priority Mail. Vintage Ralph Lauren Chaps Crewneck Sweater. Letters & Flag Embroidered. Navy Blue Mens XL. Condition is like new. Shipped with USPS Priority Mail. The sweatshirt has been previously owned with very minor signs of wear and tear from being worn. Jetsom (Rethinkresale). Ralph Lauren Mens Sweater Size 5xB New No Tags. Shipped with USPS Priority Mail. Pre Owned with no stains or holes. Minor fading throughout. Arm 24.25 in. Great looking red and black plaid wool cardigan from Ralph Lauren’s Denim & Supply Line. Worn carefully a few times with no stains, tears, holes. See photos for details. Thanks for looking and let me know if you have any questions. Vintage Ralph Lauren Chaps Crewneck Sweater. Letters & Flag Embroidered. Gray Mens XL. Condition is like new. Shipped with USPS Priority Mail. Light use and in Excellent Condition! Chest (pit-to-pit) - 23”. Length (collar-to-hem) - 30”. Good pre-owned condition. No holes or tears. Vintage Ralph Lauren Hand Knit Wool Sweater Adult Large. Lovely cream color. Hand knitted in Great Britain. Condition is Pre-owned, without flaws, minor pilling. Shipped with USPS Priority Mail. Style: Crewneck Sweater, Lightweight. Polo Ralph Lauren. Polo logo on the chest. (Under arms 23"; Length 26"). Size: Large. Men’s Ralph Lauren Polo Half Zip Red Sweater Estate Rib EUC Sz Large. Condition is Pre-owned. Shipped with USPS Priority Mail. Wool/ lambswool blend. Three front pockets. Button front. Denim & supply Ralph Lauren cable knit sawl-neck cardigan sweater. Excellent condition. Faded black color. Size large. Chest pit to pit 20.5 inch across. Length 25.5 inch. Heavy weight. 100% COTTON. Style: Crewneck Sweater, Lightweight. Polo Ralph Lauren. Polo logo on the chest. (Under arms 20"; Length 25"). Ralph Lauren Aztec Southwestern Sweater Shawl Neck Cardigan. This sweater is pre-owned from a pet free and smoke free home. Sweater is in very good condition. 10 being new this is a 8. Please let me know should you have any questions. 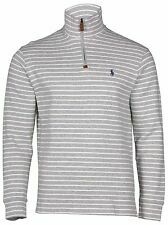 RALPH LAUREN POLO Cotton Pullover 1/4 Zip Sweater - Men's Size M Medium. Condition is Pre-owned. Shipped with USPS Priority Mail Small Flat Rate Box. Ralph Lauren Polo Country Dry Goods Men's Hand Knit Wool Sweater . Condition is Pre-owned. Shipped with USPS Priority Mail. Cotton Shawl Neck Sweater from POLO by Ralph Lauren **** Care: Machine Wash (Cold) **** Material: 100% Cotton **** Cuff Style: Banded Cuffs **** Placket Front Full Button Closure | Long Sleeves | Banded Cuffs **** Banded Hem | 2 Open Lower Front Pockets ****Click For More Details**** . Condition is Pre-owned. There are a few light stain marks around the Skier but it’s only noticeable if you’re looking for it. See close up in photos. Wonderful Ski Grapics. Beautiful Blue Color. Great Snowflake detail on buttons near shoulder. POLO SIZE XXL. BEAUTIFUL HAND KNITTED SWEATER. Nice preowned condition. Very lightly worn. 100% cotton knitted sweater, Full zip with a gold logo pull. Also embroidered LOGO knitted on the front. Please see all pictures as part of the description and measurements pictured to insure proper fitment before buying. Closet kept in a smoke free home. Free Shipping with USPS Priority Mail in the Cont USA and Global Shipping Program Only outside Cont USA. Tracking number is provided. Condition is Pre-owned. Sleeve 24". A super soft Denim & Supply crewneck sweater from Ralph Lauren! Grey with navy blue writing. Cotton/Polyester Blend. Has Cherokee Trail 1967 on front. In great shape. See pictures for details!. Crafted from 100% linen. length shoulder to hem 29". armpit to armpit 23".